The 2016 election seems like a no win situation but hey, not everyone has to lose. In the #BBCBurgerLab you can win all day, everyday especially with our new fall goodies. Here are 5 ways BBC can cure your election PTSD and unlike the others, they will never disappoint. 1. The American Hero Frappe: Ditch those hot messes and join the #freakfrappeparty...it is guaranteed to be very sweet. Our new candidate is dressed in patriotic sprinkles, American flag swag and Twizzlers that will automatically brighten up your day. AND you get the choice between vanilla or strawberry ice cream. Talk about home of the free and the brave. Come in with an "I Voted" sticker, get some dollars off (you deserve it). And while you're at it...thank the veterans who served our country all of these years. 2. Fall Sangria: We just sent out a fall sangria recipe that is so good, you'll be #wining until you get it next. Throw your P.J.s on and brew up a batch for this coming weekend. You might REALLY need it. 3. We'll bring you to Hawaii: Alright, don't be greedy. We can't send you overseas but how about we bring the vacation to you? BurgaBox just launched a November feast and it is a Hula dance in a box. After you cook up the Maui Waui Burgers, Aloha Fries and Don Ho Mac & Cheese, all of your holiday problems will wash away into the sunset, with a coconut drink in hand. You have until November 10th to order this baby. So just do it. 4. Focus on the Snacks: More people will watch the Super Bowl than vote in this election. Therefore, it looks like our priorities are in the snacks and we have a long list that will score with any Sunday football crowd. 5. You can just vote for us: Don't get stressed over this impossible decision. In our poll, you get to choose the real Hot Mess you want to vote for in this election. Now do you want to escape to another country? Yeah...we knew you would change your mind. Let's be honest, foodies. You have been too obsessed with reading blog posts and scrolling through Instagram to follow through on your Halloween costume this year. And while your friends are trying on their $80 Urban Outfitters Animal Onsies, you are frantically searching through your closet and recycling to throw together a homemade costume. Based on these assumptions...you clearly need some guidance. So check out our list of DIY last minute costume ideas that might even win a contest...or just cause some hunger pains. Either way, get your camera out. 2. Hula Man: Alright this has nothing to with food. Or does it...Hint, hint. You might of thought our October Burga Box was good...oh, just wait for November. Cue the hula skirts and tropical breeze. Look out for our email coming out on Tuesday to find out more. 3. Salt and Pepper Shakers - Grab your bestie and get shakin'. 4. A Pineapple. Get tropical. 5. 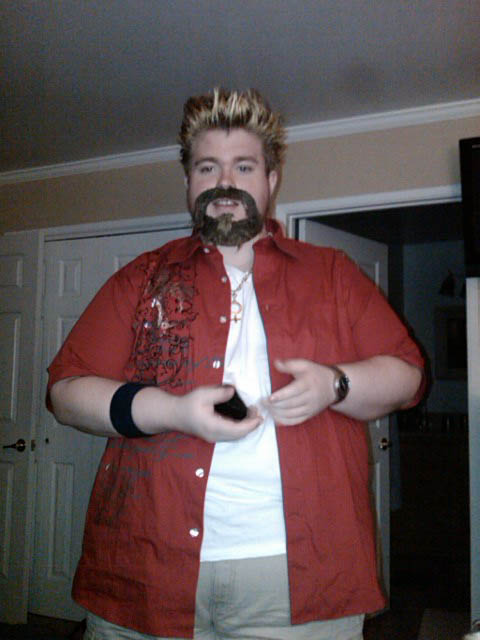 Be our friend, Guy Fieri. AKA the Host of Diners, Drive-ins and Dives and a lover of our Mac Attack Burger. 6. Sushi. Roll up to the party like...yeah! 7. Be a Freak Frappe...or just eat one.